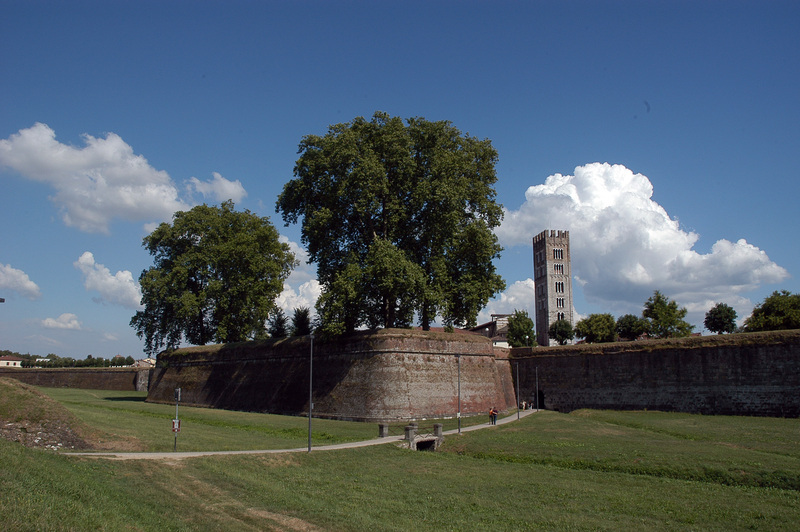 The Walls are the best-known image of the city of Lucca. This impressive monument, wholly intact, stretches without interruption for more than four kilometres, with an average height of 12 meters and surrounded for its entire perimeter by a green area of ​​75 hectares. These walls, made of red bricks and characterised by a succession of curtains and bastions, were built between the middle of the 16th and of the 17th century, as a defence. The perimeter of the walls has been modified and expanded several times, starting with the Romans. These changes were related both to population growth, and to the evolution of military and firearms techniques. The first city walls date back to the 2nd century BC and correspond to the plant of the Roman city. During the Municipal era new walls were built, which were completed in the 13th century, and enlarged the Roman ones on the east and north of San Frediano. Via Fillungo became the city's main street. A third extension of 13th century walls was built in the 14th century by defining an urban perimeter near the current matching. The final phase, which gave us the contemporary shape of the walls, began in 1513. Thanks to many experts coming from all over Italy and from abroad, the Walls of Lucca became a construction site of the most advanced theories and experiences in military architecture. The walls have remained intact over time: this is thanks to the community of Lucca that has built and maintained them, and, after Italy’s unification, has bought them from the State, which would have probably demolished them. From the beginning of the 19th century, the Walls lost their use as defensive system. With Maria Luisa of Bourbon they were transformed into a park for the enjoyment of citizens, thanks to a great work of planting tall trees on the curtains and bastions. Conceived as a work of war, the Walls thus became a monument of peace and civilization, a warm welcome and invitation to the wonders of the inner city, its architecture, its paths, its secrets. Lucca's walls are a unique promenade, the only of its kind in the world, which allows an uninterrupted view on its monuments, churches, palaces. It is a walk around the old town of Lucca, which may start from the Santa Maria Bulwark, where since 1840 the Caffè delle Mura has been located. From here, you can go down to the city through a route, which, going from Piazza Napoleone, arrives in Piazza San Michele, the centre of the city. Continue the walk along the walls to reach the San Colombano Bulwark, from where you reach ruins of 13th century walls, one of the towers of the early sixteenth-century interventions, and from which you can admire the marvellous apse of the Cathedral of San Martino. You then arrive at the San Regolo Bulwark, where to look inside the Botanic Gardens, and from which you can see the ancient public waterway ("the ditches"). After the Libertà bulwark, you will arrive at Porta Elisa, commissioned by Princess Elisa Baciocchi, Napoleon's sister, in order to open an eastern access to the city. From Porta Elisa you can go across Via Elisa for a trip back in time: from the beautiful neoclassical white marble door you can see the complex of San Micheletto and the imposing Villa Buonvisi "Al Giardino". Then, cross the mighty turreted medieval port, dedicated to Sts Gervasio e Protasio, and you reach Piazza Santa Maria Foris Portam ("outside the Roman gate"). From there, you can clearly perceive the plant of the ancient Roman city and - in Via Santa Croce - the Decumanus Maximus, its main street. Continuing the walk on the walls, you go through the curtains and bastions of San Salvatore, San Pietro and San Martino and you arrive to the platform of San Frediano. From this point, look inward towards the apse of the Church of San Frediano and the beautiful eighteenth-century garden of Palazzo Pfanner, and outside, to the great green area of ​​the walls themselves, the avenues and the hills of Lucca. From this point, you can go down to the Basilica of San Frediano, the Piazza Anfiteatro and via Fillungo. The walk continues towards the bulwarks Santa Croce and San Donato, and getting off from here you can find the final part of decumannus (via San Paolino). From San Paolino bulwark, you can return to Santa Maria bulwark, your starting point. The Opera delle Mura is an institution of the City of Lucca founded in 1999 to care for and enhance the complex of the city walls, the Botanical Gardens, Guinigi Tower, the Clock Tower and the public parks of the city. 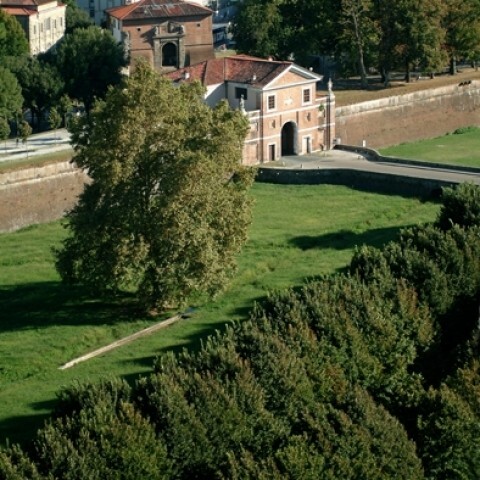 Opera delle Mura is located in the Castle of Porta San Donato Nuova and deals with the maintenance, management and use of the heritage assigned to it, its concession to individuals, and with the protection and promotion of the image of its monuments through events, studies and cultural events.